Annually, embodied carbon is responsible 11% of global GHG emissions and 28% of global building sector emissions. 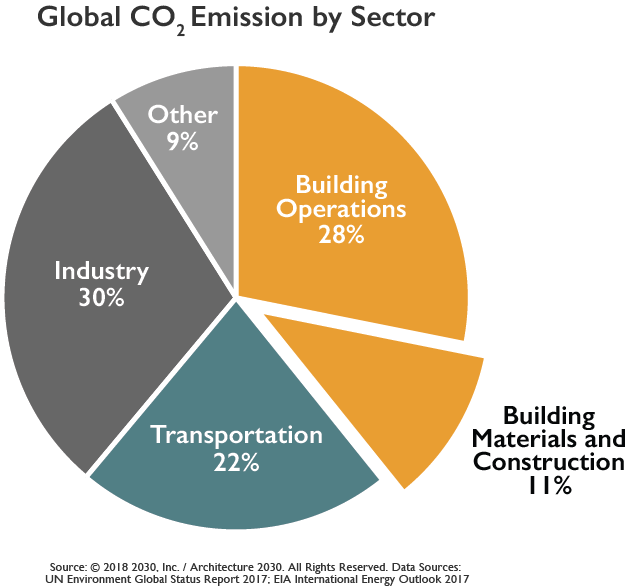 The embodied carbon emissions of building products and construction represent a significant portion global emissions: concrete, iron, and steel alone produce ~9% of annual global GHG emissions; embodied carbon emissions from the building sector produce 11% of annual global GHG emissions. When we look at all the new construction that is projected to take place between now and 2050, we see the critical role embodied carbon plays. Every year, 6.13 billion square meters of buildings are constructed. The embodied carbon emissions of that construction is approximately 3729 million metric tons CO2 per year. By the year 2050, accounting for all the new construction in that 30 year span, embodied carbon emissions and operational carbon emissions will be roughly equivalent. 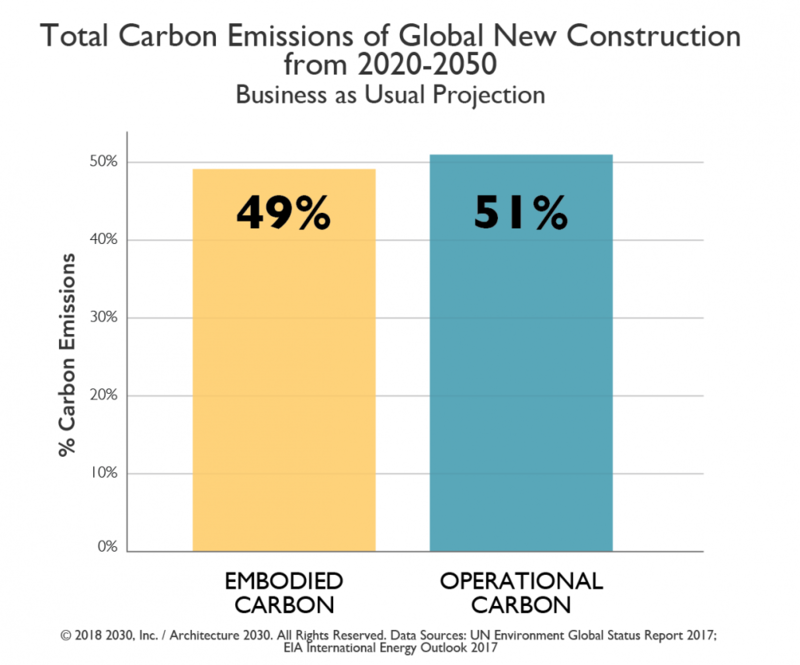 Embodied carbon will be responsible for almost half of total new construction emissions between now and 2050. Unlike operational carbon emissions, which can be reduced over time with building energy efficiency renovations and the use of renewable energy, embodied carbon emissions are locked in place as soon as a building is build. It is critical that we get a handle on embodied carbon now if we hope to phase out fossil fuel emissions by the year 2050. A carbon neutral built environment starts with design. Architecture 2030 is dedicated to empowering designers to achieve the 2030 Challenge for Products targets. Architecture 2030 has developed the tools and resources that designers need to meet these goals. An immediately applicable high-impact pathway to embodied carbon reductions, providing attribute-based guidelines for designing low/no embodied carbon buildings and specifying low/no embodied carbon products. Architecture 2030 accomplishes its mission through research and development of practical solutions, and dissemination of those solutions via networks, outreach, and targeted market engagement. The building sector is large and complex. Any transformative change requires the alignment of a variety of influential stakeholders with access to decision makers. Architecture 2030 has partnered with industry organizations, member-based NGOs, academic institutions, city networks, and private sector leaders to advance the decarbonization of the built environment at scale. The Embodied Carbon Network, co-run by Architecture 2030 and the Carbon Leadership Forum, is a collective group of individuals within nine taskforces committed to designing embodied and operational carbon out of new and renovated buildings to achieve a carbon neutral built environment by 2050. Architecture 2030 and the Carbon Leadership Forum, an industry-academic collaboration hosted at the University of Washington, co-launched the Embodied Carbon Network (ECN) – a grassroots initiative that now includes over 280 professionals from across the world, representing 90 cities, 11 countries, and 28 US states.